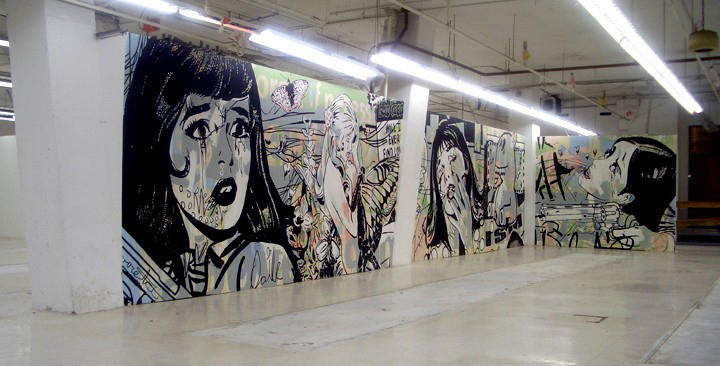 Artists: Bask, Eon, Fi5e (Evan Roth), Mister Never, Nick Z, Tes One, and Faile. The bold graphics, satirical politics, and tagging of graffiti were brought from the streets to the galleries for Wall Snatchers, an exhibition curated by DC artist Kelly Towles and sponsored by Washington Project for the Arts\Corcoran (WPA\C). 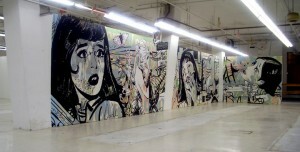 Towles’s aim was to blur the edges between non-commercial galleries and the streets, so that “an art exhibition turned out to be nothing more than street art.” In this sense, the exhibition space – a commercial building in Georgetown that had housed an office supply store – became the street and the street an exhibition space, an approach that was echoed in an open tag wall where visitors could leave their own marks. Towles chose for Wall Snatchers works by east-coast artists Bask, Eon, Fi5e (Evan Roth), Mister Never, Nick Z, Tes One, and the international collective Faile, all of whom had achieved national and in some cases international standing as graffiti or street artists. As a group they represented a surprisingly diverse array of media – working with layered canvases, watercolor, and crayon – and various approaches that included traditional tagging but also stenciling and mixed media illustration. Interwoven in their works were references to pop culture and mass media, with borrowings from cartoons and other popular sources, and occasional references to approaches or works by other artists. Most of the artists critiqued contemporary culture through their images and marks, often by commenting on the manipulation of the public by the advertising industry. Washington street and graffiti artists often met with strong resistance, in large part, of course, because of the defacement of property inherent in their work and the inconvenience and cost of the restorations that followed. Certain graffiti artists garnered notorious reputations across the city, including DC native Dan Hogg – Cool “Disco” Dan – whose tag was nearly everywhere in the 1990s, and the equally prolific Borf, the moniker for John Tsombikos, an 18-year-old graffiti artists from Great Falls, Virginia, who, during the Wall Snatchers exhibition, was serving a 30-day sentence in the DC jail for property defacement. In the case of Wall Snatchers, for which artists worked in a defined, approved space, vandalism was extracted from the act of art-making. Nearly all of the works were to be painted over or otherwise destroyed after the show closed, however, with the exception of a computer program by Fi5e (Evan Roth) that created algorithms from the gestures of graffiti artists at work. The ephemeral nature of the exhibition paralleled the ephemeral nature of street art, which was customarily destroyed in the process of restoring the walls and other surfaces that became the artists’ canvases. To conclude the exhibition, WPA\C presented a panel discussion called “Fresh Canvases: How the Street is Changing Our View of Art,” featuring Towles, members of Faile, and Marc Schiller of the Wooster Collective website. Among their topics were the relationship between galleries and graffiti and street artists, graffiti’s commercialism, the place of street art in the cultural and geographic landscape of DC and New York, and the impact of the internet, including blogs, journals, and websites.